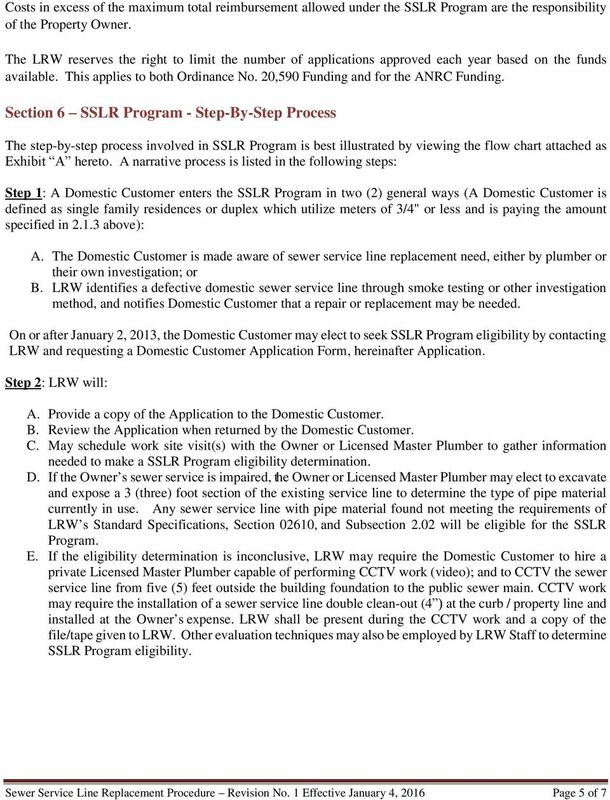 Download "SEWER SERVICE LINE REPLACEMENT PROGRAM PROCEDURE Revision No. 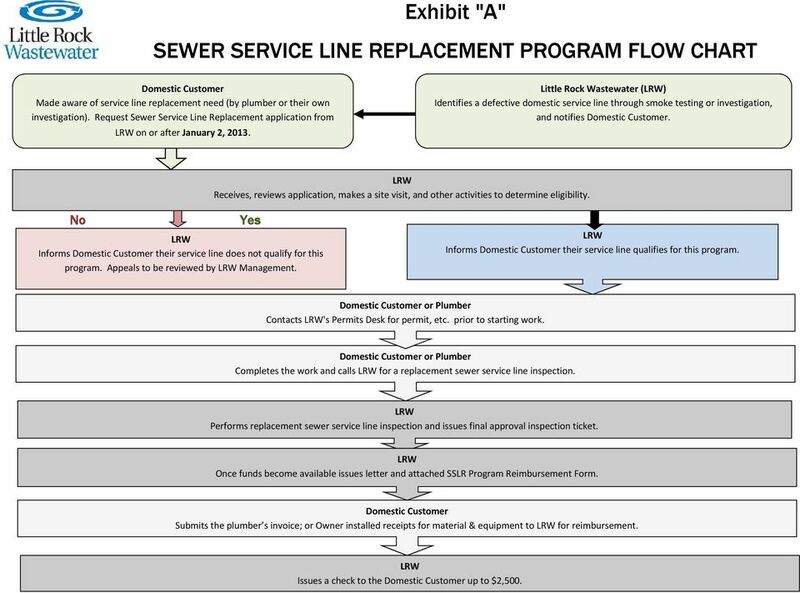 1 - Effective January 4, 2016"
8 Exhibit "A" SEWER SERVICE LINE REPLACEMENT PROGRAM FLOW CHART Domestic Customer Made aware of service line replacement need (by plumber or their own investigation). 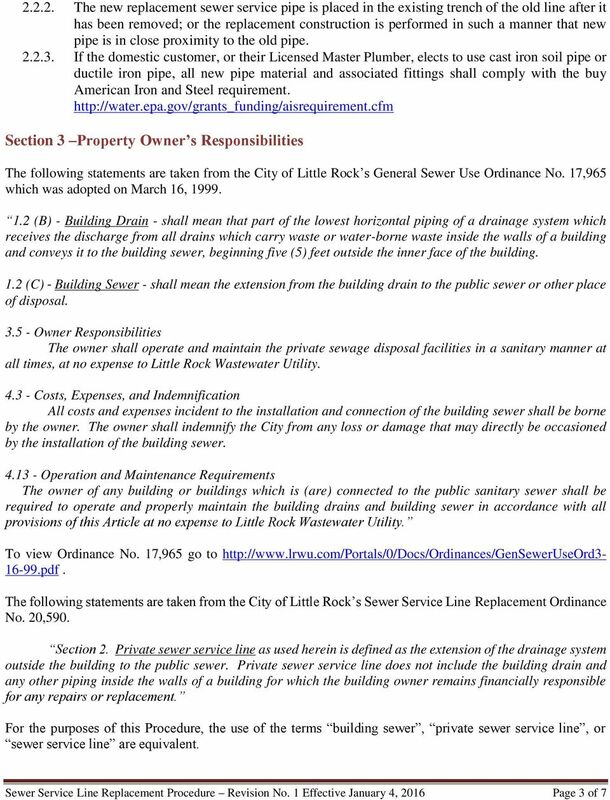 Request Sewer Service Line Replacement application from on or after January 2, Little Rock Wastewater () Identifies a defective domestic service line through smoke testing or investigation, and notifies Domestic Customer. Receives, reviews application, makes a site visit, and other activities to determine eligibility. 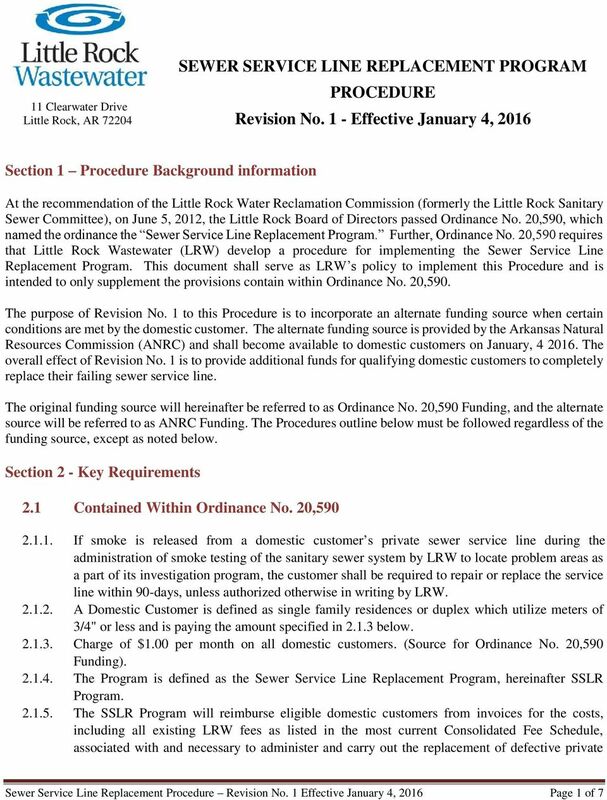 No Yes Informs Domestic Customer their service line does not qualify for this program. Appeals to be reviewed by Management. 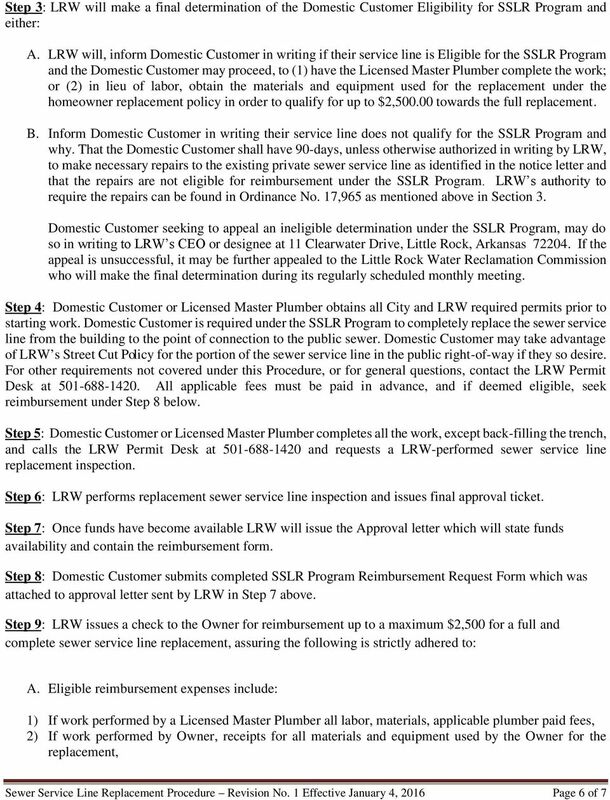 Informs Domestic Customer their service line qualifies for this program. Domestic Customer or Plumber Contacts 's Permits Desk for permit, etc. prior to starting work. Domestic Customer or Plumber Completes the work and calls for a replacement sewer service line inspection. 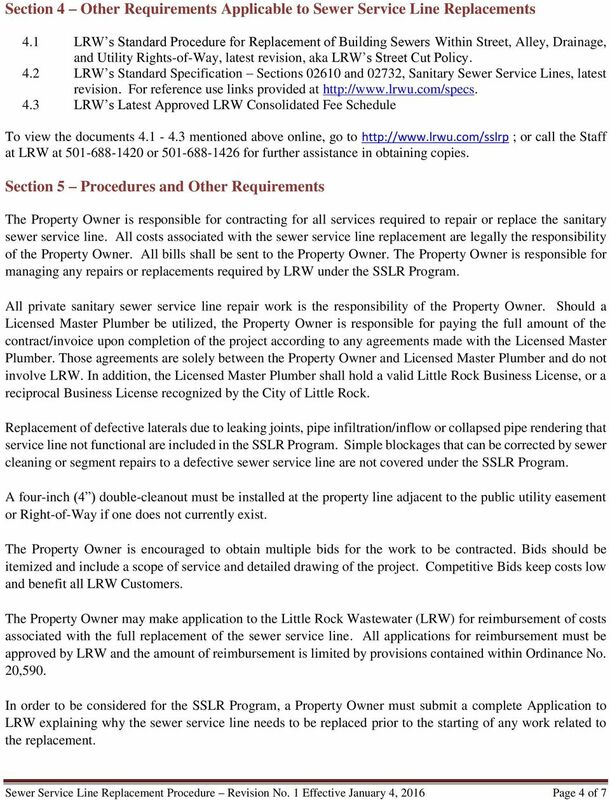 Performs replacement sewer service line inspection and issues final approval inspection ticket. 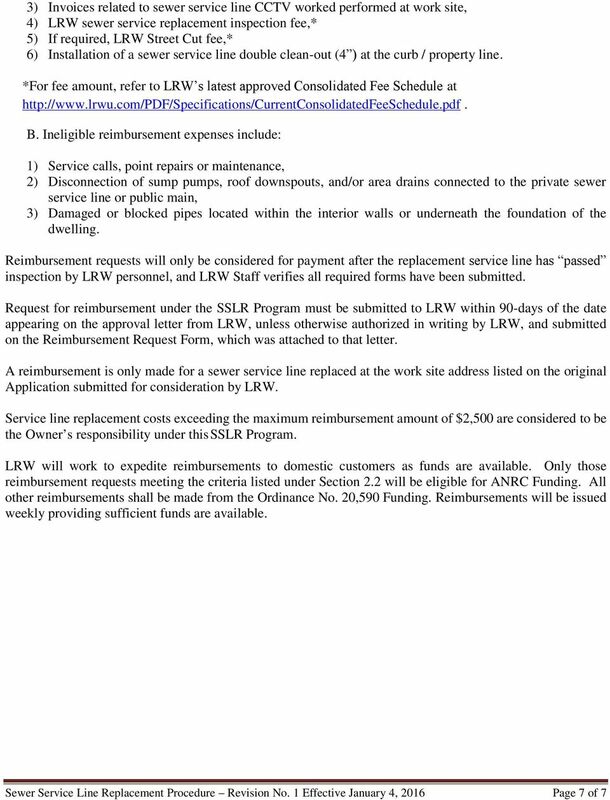 Once funds become available issues letter and attached SSLR Program Reimbursement Form. Domestic Customer Submits the plumber s invoice; or Owner installed receipts for material & equipment to for reimbursement. 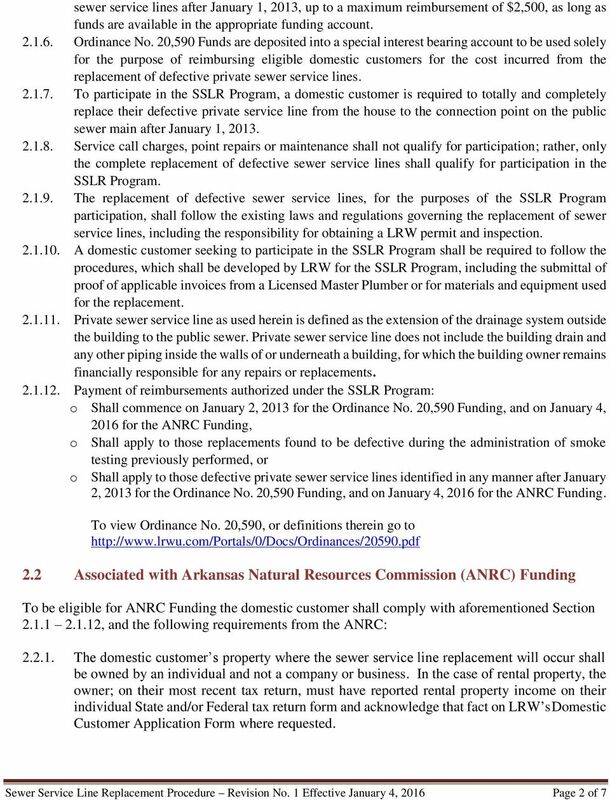 Issues a check to the Domestic Customer up to $2,500. SEWER BACK UP PREVENTION PILOT PROGRAM FINANCIAL ASSISTANCE FOR HOMEOWNERS Village of South Holland 16240 Wausau Avenue South Holland, IL 60473 www.southholland.org Table ofcontents Page What is the Program? Downers Grove. Sanitary District. 2710 Curtiss Street. P.O. Box 1412. Downers Grove, IL 60515-0703 Phone: 630-969-0664. Fax: 630-969-0827 www.dgsd. MIAMI-DADE LATERAL PILOT PROGRAM. James T. Cowgill, P.E. Rodney J. Lovett Franklin Torrealba, P.E.